One of the great things about being a writer and photographer living in one of the most beautiful spots on earth is that you never run out of great material. Writing about the same area for nearly 12 years means one ends up with a tremendous amount of content scattered across various sites. Hundreds of posts and a few books about an area can overwhelm the writer and the readers. This home page explains what I have available on this site and others. Once every four months I try do a post on my Southern Outer Banks site. With it I try to summarize what has happened in the last few months. You can usually get a very good sense of the weather and how it is trending from these posts. Normally every other month but sometimes less frequently during the cold season, I write a post on my Crystal Coast Life blog. I have converted my blog to a site with simple posts to avoid hacking. While the topics can be wide ranging, they generally have something to do with the water, beaches, fishing, kayaking, or boating. The blog fits its name perfectly. It is about my life on the Crystal Coast and there are years of posts available by month. A few times a year I write a post on my blog, The Crystal Coast, Saltwater on my feet. These posts are targeted more towards people who might be interested in living in this area, from Swansboro to Beaufort. The posts have a special emphasis on the White Oak River area where we live just up river from Swansboro. I often talk about gardening, weather or fishing. We live just three miles up the White Oak from Swansboro. This link provides a listing of all the 150 posts that are there. My wife, Glenda, and I have published three books about the Crystal Coast area and North Carolina. Our A Week at the Beach, The Emerald Isle Travel Guide is the sixth version of our five-star rated travel guide for the area. We released the updated 2018-19 versions in June 2018. The new books even have an aerial photo of the new roundabout on Emerald Isle. Kindle updates are free even at the modest price of $3.99. There is nothing like our travel guide available for this area so do not miss out. The current Kindle version has over 100 color images, lots of maps and several family recipes. To make them more affordable, the latest paperbacks have no recipes and not as many maps and pictures. The paperbacks do have 152 pages and over sixty pictures, and nine maps. If you buy one of the paperbacks from Amazon, the Amazon match book program will let you buy the Kindle version for $1.99. All our books really help people to understand and appreciate the area. If you are visiting Emerald Isle, you can pick up one of the black and white paperbacks for $8.95 from Emerald Isle Books and Toys. If you are looking for the color version, the friendly folks at the Emerald Isle Town Office carry that version. The color version is available there for $20. The two paperback versions are identical except for one being in color and the other being black and white. You can find the color version on Amazon at this link and the black and white one here. To find out more about me and my other books visit my Amazon author page. I also publish a Crystal Coast Newsletter six or so times a year. This is the signup link for the newsletter. You will find additional but somewhat irregular area observations at my Ocracoke Waves blog but they do go back many years. I post fairly regular commentary that often relates to the Crystal Coast on my my View from the Mountain blog. That site has over 1,400 posts but many posts are about anything but the coast. However, there are several about the Crystal Coast like this one, Living the Dream. I also have reviewed a number of area restaurants there like Santorini's Grille where we regularly have good meals and my all time Crystal Coast favorite, Riverside Steak and Seafood. If you need basic orientation to the area, here is a map with a few locations. The best source of information including my hand-drawn maps is the Kindle version of our travel guide which actually has some printable maps. The print version have plenty of information but the Kindle version has dozens of live links to additional information. If you are looking for a simple, free guide to the area, try this, The Quick Emerald Isle Travel Guide (Rewritten Summer of 2014). Normally this WordPress site has at least the post picture and a sentence from almost all my posts. You will also find pictures of the area at my Flickr stream and on Pinterest. I even have a site where you can buy most of the photos from my 100 pictures, 1000 Words, A Crystal Coast Year book. I even have videos of the area on my YouTube account. I am also on Twitter (not very Crystal Coast oriented) and on Google Plus (very Crystal Coast oriented). There are directions for becoming a Facebook friend in our Emerald Isle Travel Guide. You can read some history about my family and me at this link and this one leads to some of my favorite old posts which are mostly not about the Crystal Coast. If you have done business with me over the years and want to connect, you can find me on LinkedIn. There is plenty more information that I have written about the area on the Internet so do not be surprised if you run into an old article about the Crystal Coast that I wrote years ago. I try to rewrite and update some of the most useful posts. If you scroll down on this page, you will find a list of them. Whatever you see, I have not been a practicing real estate agent for over five years. Hopefully I have cleaned up most of those references. 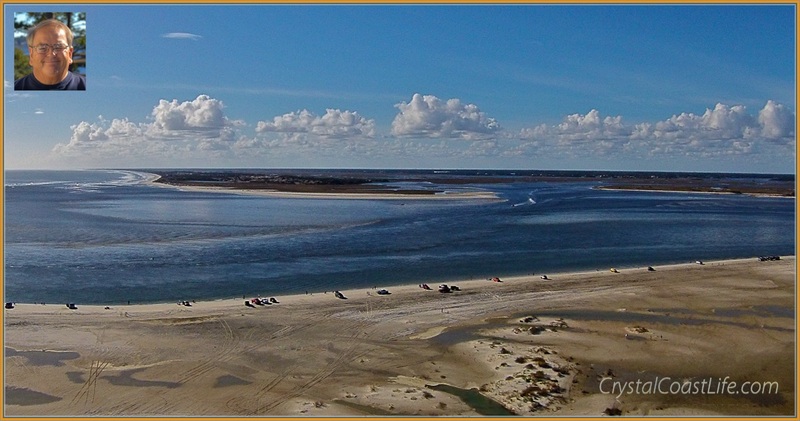 You may contact me at the following email address: david "at" crystalcoastlife dot com or use this contact form.